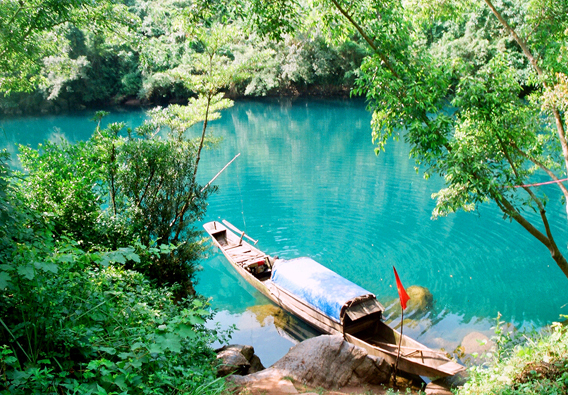 Phong Nha - Kẻ Bàng is a natural landscape that the nature has given to the Quang Binh people. Here, the harmony of the primitive forest and the river Son, along with dry cave and wet cave created a picture of mountain and river intoxicating people’s sound. Phong Nha-Ke Bang is the oldest and largest tropical karst with an area of over 200,000 hectares. 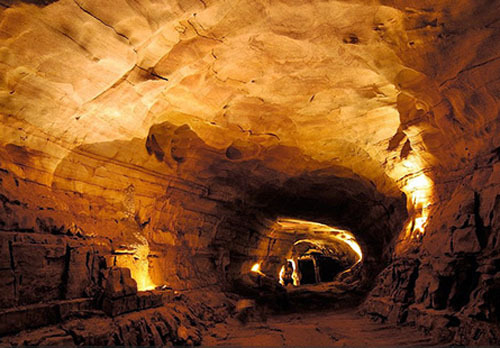 It is composed of 300 caves and grottos, hidden many strange and fascinating. Here are the caves and the typical destination of Phong Nha - Ke Bang for visitors can explore and discover this national park. Phong Nha is really outstanding in caves system, with survey length approximately 8 kilometres, included the longest underground river in the world. 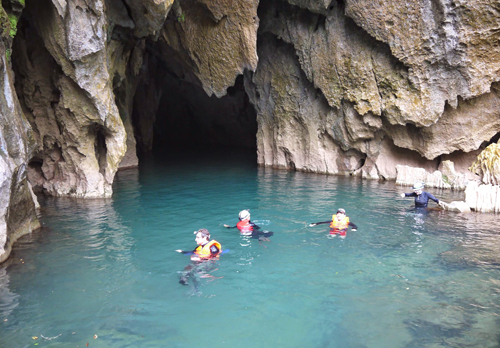 Visitors will penetrate into Phong Nha cave by motorboat . Son river is large about 35-40 meters, deep blue water, the water is as clear as crystal and you can see the schools of fish in the bottom of river. The landscape of surrounding Son river is as beautiful as a giant watercolor painting. Life along the banks of Son river is imbued Vietnamese soul. 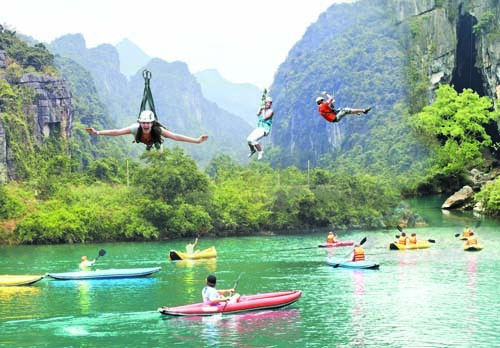 When visitors come to Phong Nha, visitors will feel very exciting, relaxing and comfortable. The atmosphere is fresh and cool. In summer, although the sun is burning with hard glistens outside, the temperature in cave is just only 17-19 degree Celsius. When visitors traveled about 600 meters inside the cave by motorboat, visitors will be stunned by the outstanding natural beauty of The number one cave. One after another visitors will discover Bi Ky grotto, the Fairy Caves, the Royal Court, and see colourful stalactites and many shapes, visitors also listen the melody in a cocktail party of Mountain spirit and contemplate limestone lobby covered with stalactites. Visitors will feel nervous as if you are lie in the mouth of giant monster. After visiting Phong Nha cave, visitors often travel to Tiên Sơn cave, a dry cave. Phong Nha – Tien Son is a twin cave that the Creator created. Phong Nha – Tiên Sơn are all one. The entry mouth of Tiên Sơn is 1 km from Phong Nha cave, at an altitude of 200 m. This cave is 980 m in length and there are no linking grottos between Phong Nha and Tiên Sơn. The road lead to this cave that is very beautiful and cross twist cliffs. Halfway up the mountain, visitors can stop and enjoy the peaceful sights around such as quiet villages in the fog, the small fields between the mountains is đòng Chày, Troóc stream. When visitors come into Tiên Sơn cave, visitors will feel that they are coming to the Eden. 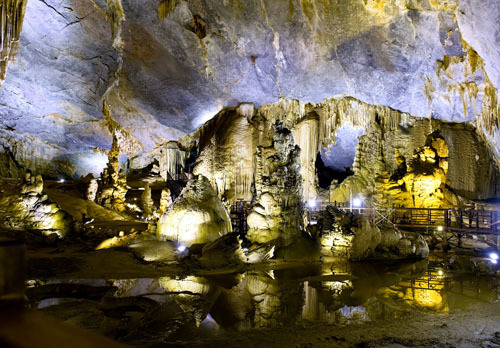 Thiên Đường cave is known as he royal palace in earths womb , it is in Son Trach Commune, Bố Trạch District, Quang Binh Province, Vietnam and one of the world-class magnificent and fanciful wonders. Thien Duong cave located at distance of 16 kilometres (from the west of Ho Chi Minh road about 4 kilometres), its in limestone complex at an elevation of 191 metres, Thien Duong cave surround the primeval forest that belong to Phong Nha - Kẻ Bàng National Park. 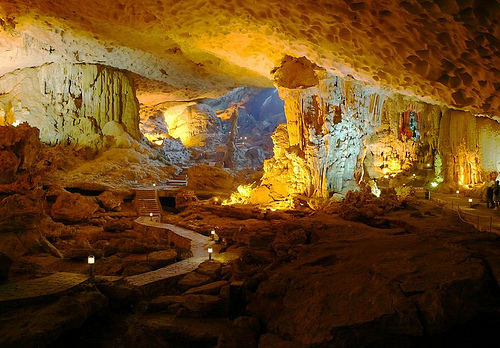 Thien Dương cave is a dry cave and the longest cave in Asia. Thien Duong cave is 31.4 kilometres in length and the width is range from 30 to 100 metres, the size of the largest place is 150 metres and the height from bottom to top is approximately 60 metres. Giao Trì palace is where the Jade Emperor discuss political affairs with courtiers, the surrounding of Giao Trì palace is the statue of unicorn, phoenix… In comparison with Phong Nha cave, Thiên Đường cave’s stalactites has more shapes. The Chay river – Dark Grotto belong to Phong Nha – Kẻ Bàng national park, it is about 50 kilometres distant from Dong Hoi city in the southwest, go along highway 15. For discovering the Chay river – Dark Grotto, visitors can select between two routes. One is starting from the tourism boat station and going up the Son river to Phong Nha cave about 1 kilometres,you will come to the confluence of the Son river, Chày river and Trooc river. When you sail along the Chày river about 5 kilometres, you will come to Dark Grotto, then at the boat station of Trộ Mơng station, the trip will ends. Two is visitors can go the opposite direction, you will start from the boat station of Trộ Mơng station and end at the Phong Nha’s tourism boat station. Chày river cruise, you will feel the river flowed serenely with water has emerald green, it will make you think that no rivers have water as clear as crystal like this river. Dark grotto is a branch belong to the system of Phong Nha cave, surveyed in 1990 and 1992 by explorers of British Royal. The width of grotto door is 20 metres and the height of grotto door is 40 metres. Like other caves in Phong Nha – Kẻ Bàng, Dark Grotto is both wet grotto and dry grotto with 5.258 metres in length and 80 metres in height, it was named by explorers of British Royal. It is called Dark Grotto because ‘dark light’ in grotto looks like stiff and people believed that they could touch it. It is still primary with a thousand of Stalactite pillars has many difference shapes and this is where many species of birds resided such as flittermouse, swallow. Especially, the grotto door area is Hà Tĩnh langur’s shelter. The Hà Tĩnh langur is categorised as critically endangered in the Viet Nam Red Book. Dark Grotto located at Son river’s side which is a branch of Chay river so that humidity in the grotto is high. Consequently, stalactites have a specific green color of moss. When tourists travel to En Grotto and Rao Thuong Stream, they will witness the romantic choral song of the river, the stream, the mountain in Phong Nha – Kẻ Bàng where has the beautifull landscape as fairyland. 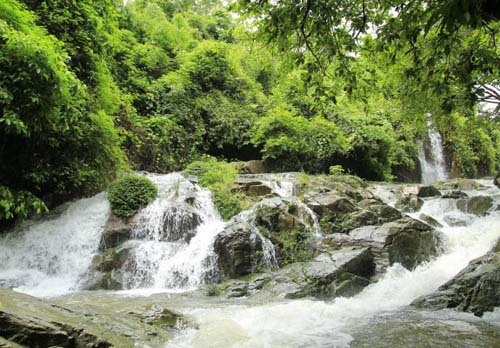 Besides, during their trip to En Grotto, visitors have a chance to enjoy the immense, grandiose beauty of the large primeval forests, azure and charm of Rao thuong stream, unending lanscapes that are bestowed by nature. Rao Thuong Stream known as Doong Stream, rises from U Bo mountain peak and some small ravines in Truong Son mountain ranges. This stream is not deep, has alluvial grounds. The stream is also cool and clear so that visitors can be able to see shool of fish which are swimming freely. Én Grotto is 1.645 metres in length.It has 3 ways out, one is in halfway down the mountain, the others are in the foot of mountain in the southeast and northwest following the Rao Thuong’s flow. This is an unique feature of En Grotto in comparison with many famous grotto in Viet Nam. En Grotto has unique features which Phong Nha cave and Thien Duong cave do not have, is mixture deep green color of river with light from the well hole on the celing of En Grotto. It makes a sparkling, fanciful scenery. On the Ceiling of En Grotto, many cavities of rock are multiform stalactites, are swallow’s nests and bat’s nests. Seen from inside, scenery is lively, sandbank is large, primeval forest is azure. photographer Carsten Peter selected this place for creating his work – Én grotto, this work considered to be one of the best beautiful of photos of nature by National Geographic magazine in March 2011. From Phong Nha Park, go straight along Hồ Chí Minh street (on the east side) in a northerly direction to the turning point Khe Gát, then turn to the west of Ho Chi Minh trail (on the west side) about 10 kilometers, visitors arrive Mooc Stream Eco-Tourism Area. Visitors can also arrive Mooc Stream Eco-Tourism Area by rowing Son river upstream, then turning to Chay river over 6km. Water of the stream is clean and blue all year round and it becomes clearer and more turquoise during scorching days in summer. Water sprouts out from the earth’s worm, and geologists say that the source of water originates from a system of mysterious underground rivers running through the range of limestone mountains in the headwater of Mooc Stream and is the confluence of many rivulets. Joining the Phong Nha - Mooc Stream Eco-Tourism tour, visitors will be discovered the diversified, valuable and rare world natural heritage site on the trail through forest. Besides, visitors will be contemplated columns of water rising up wonderfully from underground, sneaking under the canopy of leaves, and then making their way to the nearby Chay River. Visitors can hang up the hammocks under the canopy of leaves and listen to sound of stream or they can take the waters at Mooc Stream. Moreover, they take a kayak trip, swimming race, go fishing…, Visiting the eco-tourism area, tourists have a chance to enjoy local specialties. Mooc Stream Eco-Tourism Area is very different from other destinations in Phong Nha – Ke Bang national park. It remains primitive beauty, which attracts visitors. With picturesque scenery, charming landscape, fresh air, Mooc stream is an interesting tourist destination for those who want to travel, relax, take a rest. Come to the Survival Valley and Aquarium palace cave in Phong Nha-Ke Bang National Park, Visitors will be immersed in the natural surroundings exotic, there are rolling mountains, with winding rivers, green valleys untouched eyes, and especially an extensive cave systems such as: Aquarium caves, cave Valley with scenic natural bamboo, wild, ideal for tourists who love exploring caves. It is an opportunity for visitors to gain a better understanding of the value of forest biodiversity World Natural Heritage National Park Phong Nha - Ke Bang. Thuy Cung (Aquarium palace) cave is in the middle of the Survival valley with exotic color of blue water. Inside the cave, water is more tender and feminine with jade blue color. When it was first discovered, Thuy Cung cave was named Blue Water Cave by for its mysterious and strange color. Even nowadays, explorers cannot find the origin of this water or why it gets such a color. People only know water from Thuy Cung cave follows Tien Stream to Nuoc Lan Cave and finally pour to Toi Cave. The farther you get, the more exciting you are. The Cave is an undersea palace with colorful and elegant stalactites. Even the echo of your voice sounds so mysterious and lingering.